The ClientLook commercial real estate CRM software is used as a company-wide hub for contacts, deal and properties. It can also be connected to a variety of industry leading solutions like Buildout to enable incredible new features. If you’re a Buildout user then this integration is for you. Send ClientLook properties to the Buildout marketing solution to streamline the listing process and create amazing marketing materials. Connecting Buildout to ClientLook takes less than 60 seconds. This one-time setup requires no special techincal expertise and works for everyone sharing your account. The integration with Buildout is another ClientLook first in a long line of market leading innovations. Build your property inventory in ClientLook while you nuture relationships with owners, investors and tenants. When it’s time to lease or sell one of those properties, just click a button to send that property’s data into Buildout to create your marketing materials. How easy is that? Easily connect Buildout to ClientLook with a single “secret key” that works account-wide. Send property data and photos to Buildout with a single click. No more redundant data entry. Identify up to three (3) ClientLook users as listing brokers for each property you send. Send ClientLook property updates to linked Buildout properties over time. Works with any property type and sub-type supported by Buildout. 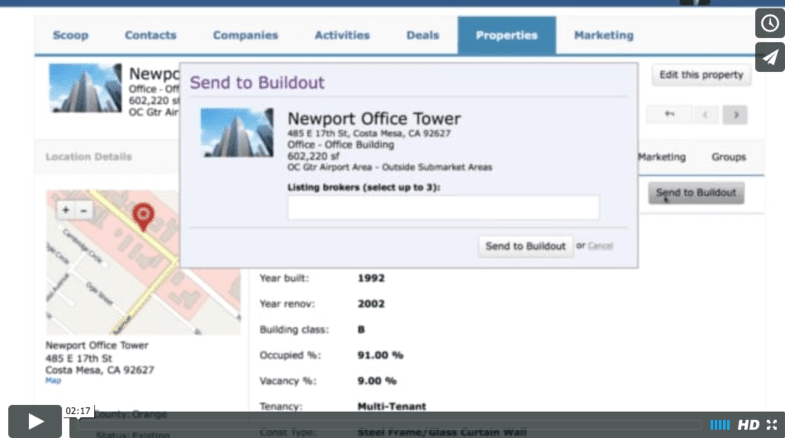 Video: Learn how to connect to Buildout and send a property from ClientLook. Buildout users will need a special API Key to connect their Buildout account to Clientlook. Obtain your key by contacting Buildout support at support@buildout.com. Just tell them you want to link Buildout to ClientLook, and let them know we said hello. This integration with Buildout is in its initial phase. As we add more features to ClientLook we’ll be able to extend our integration even further. Let us know what you think and how we could make integration like this even more powerful. looking forward to further integration! Thanks Richard, so are we. We’ve got some big plans for the next iteration. If you ever have any ideas for us, then please let us know.